When we talk about habitat management, prescribed fire finds itself at the top of the list in beneficial techniques. The tool is is the exact thing habitat managers and hunters are looking for, it is often times the biggest bang for your buck. Ultimately, it is the reset button for the habitat. After a few years of growth a fire will reset the forage back to a state that remains productive and at peak quality for white-tail deer and many other game species. What tends to be lacking is our education on the proper and safe use of the tool. 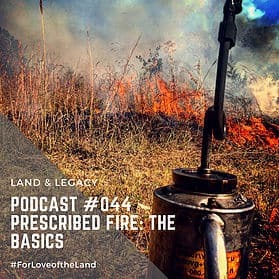 So, this week we cover the basis for using prescribed fire to enhance your property and the wildlife that call it home.